I hate it when I take too long of a hot shower. My skin feels tight and dry like it’s going to split open. The worst is when it happens right before going to work. Then I have to suffer through the day daydreaming of taking a bath in body lotion. Bleh. 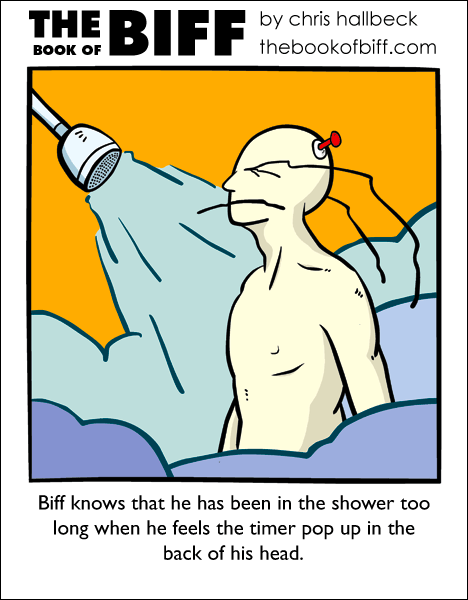 I’m an extremely protracted bather, with a bad habit of falling asleep in the shower; I could totally use one of those timers. but dont you usually stand up in the shower? It’s entirely possible to fall asleep standing up. I should know. I usually shower until the water heater we have stops keeping up. Where I live now, that has yet to happen. I stood there for a good half an hour one day, and I was still getting nice hot water. I love living in a single apartment with a water heater designed for a house with 4 people. Me too. I did once. My brother, instead of waking me, decided to watch the disaster unfold. He said I was OK for about 15min and he thought I would never fall, but then my knees gave way and I just slumped ripping down some curtain/cloth thing with me. Oh well. Good times. Well, I find it more pleasant and relaxing to run a shower but engage the stopper anyway; it’s like a bath, but filled from the shower nozzle. That’s how I meant fall asleep in the shower. I dont think he was showering, maby just standing by the window, and he fell asleep. I love hot showers, my little brother goes off to school, my parents to work, and i take a nice hour long shower, but if i dont slowly bring the temprature down to a chill, its a bit of a shock walking into frigid air. unfortunately we have constant showers in the u.k. as it’s ALWAYS RAINING. It’s a wonder we don’t have permanent prune skin. Oh ya, nothing’s better on a cold day than a nice long hot shower. On hot days it’s also nice to have a nice long cold shower, but I prefer hot ones. I always fall asleep in the shower, i have one of these massage extensions, so if i lay down, it feels like a spa. I assume I’d fall asleep in a spa too, but that’s really beside the point. I would say it looks more like one of those things you pull out the side of an inflatable pool piece to blow into it. I like doing the stopper thing too. It feels like its raining while I’m taking a bath. Wow, that has got to feel wierd when a button pops out of your head*snicker**snicker*. I have a sunburn. It’s the only time my feet get warm. What happened to comic 337? In the bad ol’ days, when I still did the submarine thing, I’d come off patrol reeking of boat-stink. I’d take a six of cold beer, set it just outside the shower, and proceed to soak and drink. When the beer was gone, the shower was done. Great way to get back into a more-or-less human-normal frame of mind. @Ice: heh, you maybe. I take a shower for 48 minutes and nobody comes round telling me I’m killing the country. I apparently don’t have a timer on the back of my head ’cause I could stay in the shower forever. I shower just enough to clean up and relax a little. As for water limits, I don’t really push that many limits when it comes to resources. Still, a timer? Must of been a replacement for that umbrella implant. I can take a shower in three minutes flat if I need to, and skip conditioner. this one and the 338 have some kind of duplicate display issue.